The warm weather on Monday and Tuesday melted away most of the snow around Lake Wicwas this week. Where last week there was still about 90% snow cover in the woods, now it's down to less than 5%. There are still large patches of snow, but they are few and far between. It's clear where all that snow has gone - last week the lake was several inches below full, and now it's 8 inches above the full lake level - a rise of 14 inches over just a few days. Some snow melt has been captured in vernal ponds around the lake, and the tree frogs have come out of their winter hibernation and are now calling their mates. (They sound a lot like ducks.) These frogs are amazing – unlike most amphibians that hibernate in the mud at the bottom of bodies of water, wood frogs hibernate under leaves and debris on the floor of the forest. They freeze rock-solid, but somehow thaw out in the spring, come to life, and travel to vernal ponds for just a few days to mate. The ice on the lake on the other hand, did not make as much progress as the snow did. The openings around the shore are getting larger, and now encircle most of the shoreline, although there are sheltered areas where there is still ice right to the shore. Ice-out is still a ways off, as there are still 19 inches of ice just a few yards away from shore! The nights are still cool, and in the morning the open water is often frozen over again. The water under the ice is extremely clear right now, as one might expect with no waves, boats, or even animals to stir it up. It's always interesting to see the tracks of winter's activities show up as the ice melts on the lake. I would never figure out what made the strange marks on the left if I only saw them as they emerged in the spring. The large tracks on the left are from a snow shoe trip back on February 6 - the ski tracks are from early March. They have been covered up with snow and ice for weeks, but somehow they emerge quite plainly this time of year. 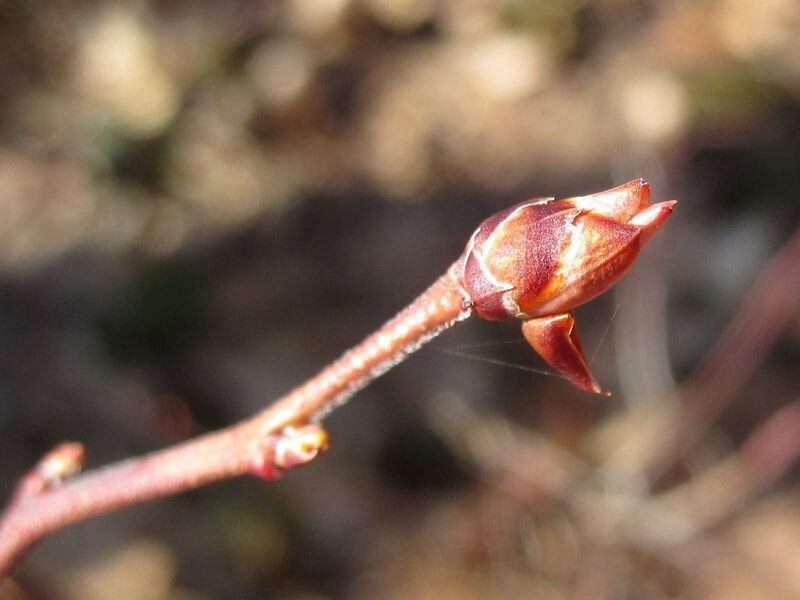 The buds on the trees haven't burst yet, but I did find a few blueberry bushes that are getting close.